CAIRO, Egypt – For the first time ever, a delegation of Christian evangelicals from the United States met with Egyptian President Abdel Fattah el-Sisi. Some believe the meeting represents a landmark in evangelical relations with the Arab world's largest country. An estimated 90 percent of Egyptians are Muslim. 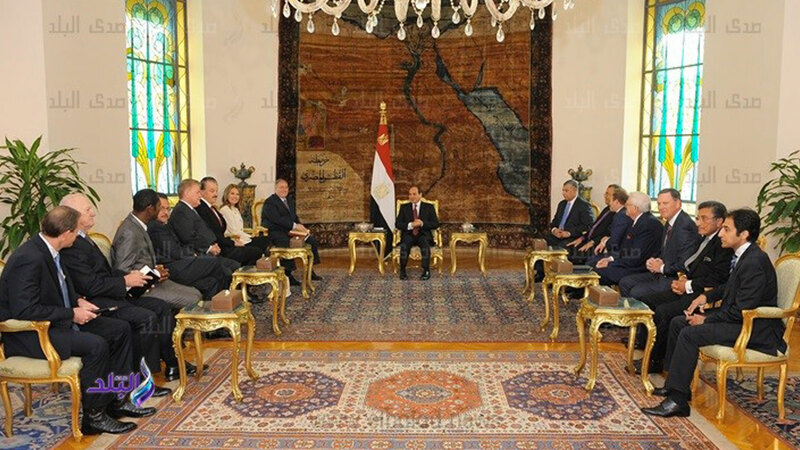 The meeting between President el-Sisi and the evangelical delegation exceeded their expectations. "Rarely have I been in a meeting that was scheduled for an hour that went for three hours and the conversation was clear, so authentic," Johnnie Moore, founder of the Kairos Company told CBN News. "There was no hedging. It was like we were best friends for our entire life. It was historic yesterday." Best-selling author and Middle East expert Joel Rosenberg, who hosted the delegation, believes el-Sisi is the kind of leader the U.S. needs in the war against Islamic terror. "I believe it is setting into motion an historic relationship between an Arab Muslim leader and the evangelical Christian movement," Rosenberg told CBN News. "I have to tell you, I'm a fiction writer and if President Abdel el-Sisi didn't exist you'd have to make him up. I mean [he is] what are we looking for in an ally with the United States: people who want, people who are telling us I want a strong, strategic alliance with America. I'm fighting the same people you're fighting." During their meeting, el-Sisi stressed the importance of fighting Islamic terrorism and protecting religious freedom. Former Congresswoman Michele Bachmann praised the Egyptian president. "As a former member of the United States Congress, I can tell you that President el-Sisi is the best of the best in Egypt – on a political and military level – that he's here," Bachmann told CBN News. "But I can also tell you that as a believer in Jesus Christ, I'm extremely proud to be associated with President El Sisi because he wants to be sure that I, as a Christian in Egypt, am able to practice my faith and belief without having that disrupted." The delegation also met with two influential Muslim leaders: Egyptian Grand Mufti Shawki Ibrahim Abdel-Karim Allamand and Mrs. Jehan Sadat, the widow of Egypt's former president Anwar Sadat. It was Anwar Sadat who forged an historic peace with Israel in 1979, a peace that has endured for decades. "It is so important that such a wonderful group like them [are able] to visit Egypt and to get to know the Egyptian people are for peace," Mrs. Sadat told CBN News. "We want to build our country, we want to do our best. We want to do more hospitals, more schools, more, everything to make the country – to elevate the standard of the people." Egypt is a land rich in biblical history. Here, Pharaoh's daughter rescued Moses from the Nile River. It's the land of Joseph, the Israelites and the Exodus. It's where Jesus sought refuge as a child. Egypt is mentioned more times in the Bible than any other country except Israel. That's why these evangelical leaders believe God has a special calling on this nation. "We, as Christians, love Egypt because the scriptures indicate that God has this great love for Egypt – not even just a general love," Rosenberg said. "There are specific verses, specific prophecies about God's love. Isaiah 19 speaks of Egypt, My people." Some believe the meeting may represent winds of change in the Middle East. "As I travel around throughout the Arab world, there's a new openness, there's a new cooperation," Moore said. "The horrible events of recent years have awakened everyone not only to the idea of peace, but the necessity of it, and we have nothing to fear by freedom." The delegation also met with Egypt's evangelical leaders, providing an opportunity for both to share from their hearts. Dr. Andrea Zaki, who heads the evangelical church in Egypt, called the meeting "very prophetic and very inspiring." "A fantastic meeting, sharing the hopes, the dreams, the challenges facing evangelicals here: how they look to the future, how they can together build a coalition for the Kingdom of God," Dr. Zaki told CBN News. "The meeting was very prophetic and very inspiring." Dr. Zaki, president of the Protestant Community of Egypt, also serves as general director of the Coptic Evangelical Organization for Social Services. "We are an emerging church, a growing church," he continued. "We have confidence in God and we are working together to bring the Kingdom of God. We are pro-stability, co-existence, respecting the others; we are pro-building the Kingdom of God by inviting people to come to Jesus, but also building co-existence and peace." Dr. Michael Youssef, with Leading the Way Ministry, believes it's vital to pray for the church in Egypt. "Sometimes they feel all alone, so for us to come here and to say, 'You're not alone. We're with you. We pray for you,'" Youssef told CBN News. "In fact at our church, we pray every Sunday and every Wednesday for the persecuted church, not once a year. We pray for them on a regular basis, and we support them in every way we know how so that was a shot in the arm for the believer and the Christian leaders in Egypt today. So we really need to be in prayer for the Christians here." President el-Sisi also asked for prayer. "He asked the Christian community, 'Please pray for me. Please pray for Egypt because we are in a battle," said Rosenberg. The delegation wants to build a genuine friendship with Egypt's president and Rosenberg sees the visit as an historic opportunity. "This is one of those rare moments in history when God allows the followers of Jesus Christ to build relationships with world leaders to be ambassadors for Christ," he said. "This is what the Apostle Paul talked about – that we are ambassadors of a Kingdom, Christ's Kingdom." «'We Need to Protect Our Faith Leaders from Government': Will Tax Bill Really Repeal Johnson Amendment?